First, a thank-you shout-out to my friend Linda in New Braunefels, TX. 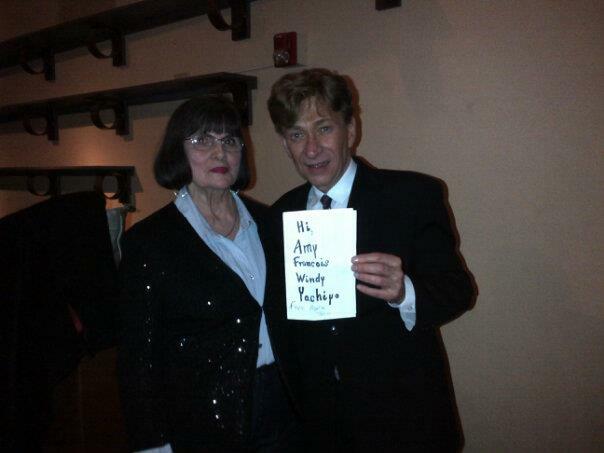 Linda went to see the incredible jazz singer Bobby Caldwell in Austin, TX last Friday. Knowing that Mr. Caldwell does a meet-and-greet after and between concerts, I asked Linda if she would give him my regards. Not only did she do that, she took a picture with him, and they had a note saying “Hi” to me and a few other fans who couldn’t make it. OMG!!!!!!!!!!! Second, giving a shout-out to Jennifer in the bakery department of Central Market in Houston. I met her a few weeks ago when I visited, and when I went back last week–she remembered me! Nice lady, and they produce some amazing works of confectionery art. Unfortunately, I’m about to show my hypocrite side. Yesterday, I had a delicious foodie adventure. 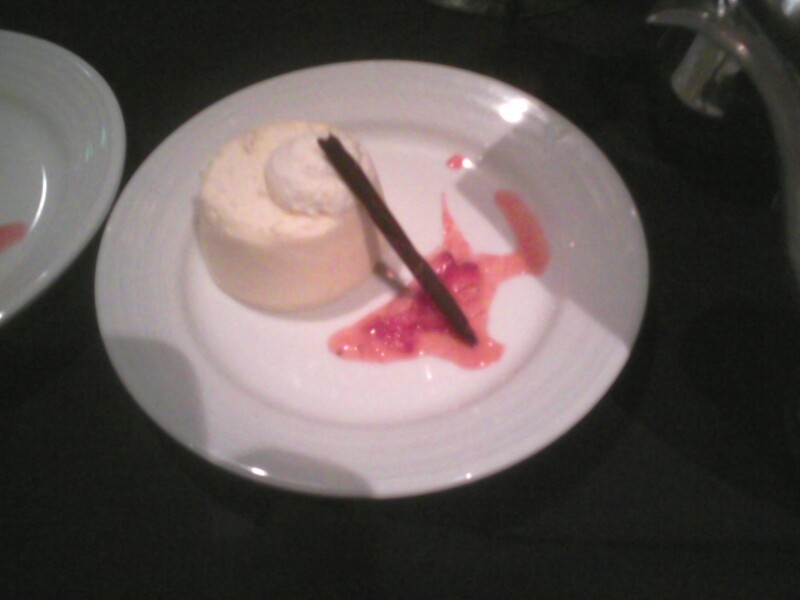 And dessert was SOOO good, I had two. More on that in a minute. Of course, Miss Hip & Edgy Food Blogger walked out without her camera, so I could only do cell phone pictures. I also exercised last night when I got home. The featured speaker was Dr. William Davis, a board-certified cardiologist in Wisconsin who wrote the best-selling book Wheat Belly. It was a pretty popular activity–while it wasn’t a sellout, it was a packed house. I’ve written about this kind of thing before–if you haven’t seen it, check out my post on Babycakes, the bakery and cookbooks for vegan/wheat free baked items. There were a number of vendors there, including Frost Bake Shoppe, serving samples of a wheat-free cupcake they make. With chocolate frosting. Yes, I sampled it. More than once. Must go visit next trip to The Woodlands. Like I told ya, chocolate is my first love, that’s why I’m single. Also in attendance was Red Mango Yogurt–they have NUTELLA yogurt. OMG. No kidding. And yes, it is indeed gluten-free. It’s actually called “Nutty Potion No. 9,” but it really was wonderful. Hope they put more Red Mangoes around Houston. Yes, I asked for an autograph for the book. I also admitted to the good doctor that I do, on occasion, visit Taco Bell. My doctor, who was standing next to him, is aware of this. He cringed! But there is the Cabana Bowl, which has rice but not wheat in it. Again, not very often, and I still have not tried that delicious looking cookie they have, ’cause I know I’d never stop. STOP EATING ALL FORMS OF WHEAT. IMMEDIATELY. FOREVER. Even if you don’t have a wheat allergy or wheat problem, it’s beneficial to stop wheat intake completely. I generally don’t consume wheat, except on occasion, but I’ll be reading labels a little closer once I finish the book and know what to look for. Work of art. 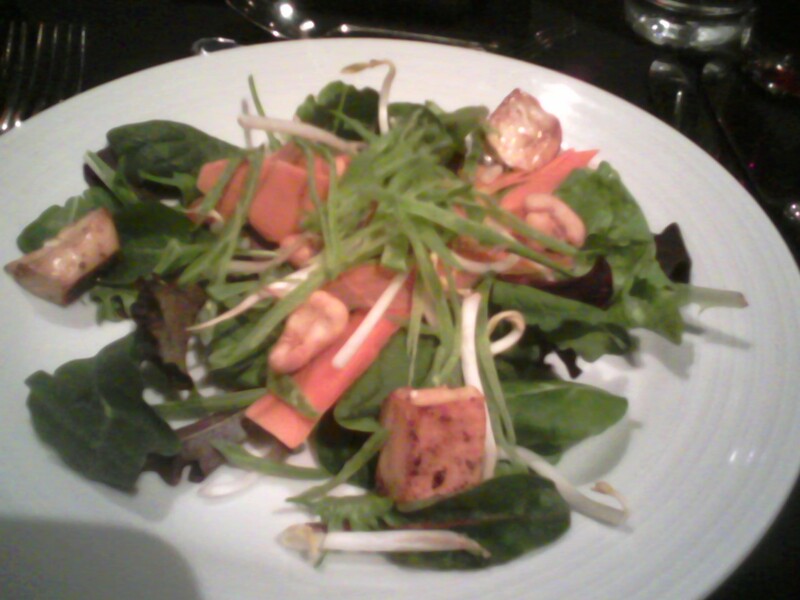 Unfortunately, those “croutons” are grilled squares of tofu, so readers of my humble blog know what I did with them. (I didn’t eat them.) The dressing was a delicious vinaigrette, which was supposed to be made from miso, (oops) but the little bit I had didn’t bother me. 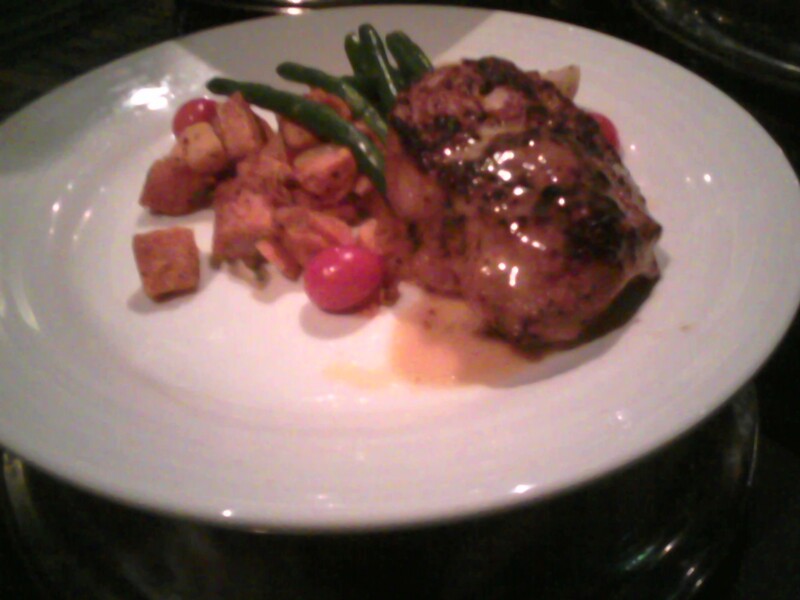 Chipotle chicken with roasted sweet potato and parsnip, and green beans with a couple of roasted grape tomatoes. My dinners don’t get artfully arranged like this, though. Amazingly, NOTHING needed salt. I never touched the salt shaker. Honest. A crustless strawberry cheesecake with strawberry compote and that little twiggy stick is made of dark chocolate. I don’t do that very often, honest. Most of the time, when I get a craving for sweets, I go for the Chocolate Chip Brownie or Chocolate Chip Cherry Torte Larabar. Yes, extra calories, but a lot healthier (wheat, soy and GMO free) than the regular desserts I could have. Admittedly, the reason I had two desserts was that we weren’t a full table, and there was more than one that would likely get trashed. There were actually three salads and three desserts left, because there were three empty seats. So to reduce food waste, I had one of those extra desserts. I enjoyed it, as well as some other delish nibbles from the vendors named above. Honest, I exercised for 45 minutes last night. Admittedly, most restaurants and hotels will accommodate you if you ask for gluten free, kosher, or vegan/vegetarian these days. When I was at Bootcamp last year, I saw a couple of folks get “specialty” meal at the Delray Marriott; they just had to ask in advance. (Me, I figure, I’m on a trip, everything is beautiful, I’m gonna try all of it. Then again, I steer clear of wheat and soy and enjoy the rest within reason. Sorta.) However, one of my friends couldn’t quite get enough to eat doing the vegan thing, prompting an older waiter to say to her in his thick Eastern European accent, “You want to live to be 100? Eat red meat!” Much as I admire this lady, I had to laugh. I felt bad for her, because I understood, but I also agreed with Grigor the waiter. Anyway, that’s what I was lucky enough to have for lunch yesterday. Understand that it was a special occasion, not an everyday affair for me. Today, it was the last of the roast chicken with pears. . .wait, did I post that yet? Ooops. . .coming soon, a recipe review. Soon as I finish reading Wheat Belly and give you a full report.